We’d love your help. 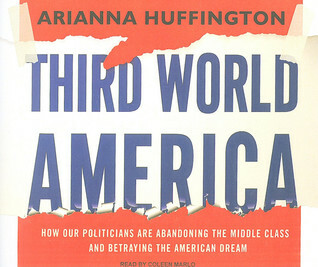 Let us know what’s wrong with this preview of Third World America by Arianna Huffington. It's not an exaggeration to say that middle-class Americans are an endangered species and that the American Dream of a secure, comfortable standard of living has become as outdated as an Edsel with an eight-track player—that the United States of America is in danger of becoming a third world nation. The evidence is all around us: Our industrial base is vanishing, taking wi It's not an exaggeration to say that middle-class Americans are an endangered species and that the American Dream of a secure, comfortable standard of living has become as outdated as an Edsel with an eight-track player—that the United States of America is in danger of becoming a third world nation. The evidence is all around us: Our industrial base is vanishing, taking with it the kind of jobs that have formed the backbone of our economy for more than a century; our education system is in shambles, making it harder for tomorrow's workforce to acquire the information and training it needs to land good twenty-first-century jobs; our infrastructure—our roads, our bridges, our sewage and water, our transportation and electrical systems—is crumbling; our economic system has been reduced to recurring episodes of Corporations Gone Wild; our political system is broken, in thrall to a small financial elite using the power of the checkbook to control both parties. And America's middle class, the driver of so much of our economic success and political stability, is rapidly disappearing, forcing us to confront the fear that we are slipping as a nation—that our children and grandchildren will enjoy fewer opportunities and face a lower standard of living than we did. It's the dark flipside of the American Dream—an American Nightmare of our own making. Arianna Huffington, who, with the must-read Huffington Post, has her finger on the pulse of America, unflinchingly tracks the gradual demise of America as an industrial, political, and economic leader. In the vein of her fiery bestseller Pigs at the Trough, Third World America points fingers, names names, and details who is killing the American Dream. Finally, calling on the can-do attitude that is part of America's DNA, Huffington shows precisely what we need to do to stop our freefall and keep America from turning into a third world nation. To ask other readers questions about Third World America, please sign up. Something needs to be done about democracy, particularly democracy in America. It seems clear that the vast majority of American people actually want to see America become a more equal society, a society where there is a ‘level playing field’ and where most people actually are in the ‘middle’ and not clustered about the ‘extremes’ of the very poor and pointlessly wealthy. That they want their politicians to do things to put people into jobs and to provide a reasoned debate about things that matt Something needs to be done about democracy, particularly democracy in America. It seems clear that the vast majority of American people actually want to see America become a more equal society, a society where there is a ‘level playing field’ and where most people actually are in the ‘middle’ and not clustered about the ‘extremes’ of the very poor and pointlessly wealthy. That they want their politicians to do things to put people into jobs and to provide a reasoned debate about things that matter. And yet, looking in from afar, the main person in the news over there (and it seems the person most likely to become the next President) is some nut job from Texas – someone that makes Bush II look good in the way I understood Shrek 2 to be much better than I had remembered it after I had seen Shrek 3. It is almost as if Rick Perry’s sole aim in life is to take from the poor so he can give to the rich. It is all very depressing. The main thing I will remember from this book is the idea that if you were to get everyone in America and stand in a line from richest to poorest then the person right in the middle would be the middle class. This seems like as good a definition of middle class as any other I’ve ever heard. The terrifying thing this book points out though about this guy in the middle is that since the mid-1970s they have seen their real income drop. This is despite the fact that their productivity as a worker has substantially increased since then. This should be a national scandal, instead people just shrug their shoulders. An article I read recently suggested that despite being prepared to bring the world economy to the brink of economic collapse rather than contemplate taxes on the obscenely wealthy (and despite some of the obscenely wealthy saying they should be taxed), the Republicans are looking at ways to increase taxes on the middle class. The US can hardly be considered a democracy anymore, it is now a plutocracy – so much so that even trying to imagine someone from the poor even thinking they have an equal say with someone from very rich is so unthinkable as to be nearly satire. Even Obama became president as a millionaire (estimated wealth at the time – it has grown substantially since, apparently – was between $1-2.5 million) – although, admittedly, that did make him the poorest of all of the candidates. If Pascal was right and we laugh and cry about the same things, it is time for a sitcom about a non-corrupt politician, not beholden to corporate interests and lobbyists. Someone who could say classic one liners like, “I’m not sure how that would wash with my electorate”, “I can’t take your money” or “Our democracy is based on the separation of church and state for the benefit of both church and state”. The great sucking sound of US jobs leaving the country is so loud now that people can’t hear it. Nothing is done to alleviate unemployment except words – sure there is talk, but talk is cheap. Trillions of dollars were poured into banks ‘too big to fail’ by sucking money out of families too small to bother about. This book is supposed to leave the reader with a sense of hope. Following page after page of statistics that would make you weep and near endless examples of just how dire, just how intractable the problems facing us are, she thinks a couple of feel good stories of people Bill and Ted-ing (being excellent to one another) will be enough to bring back that inner glow. Well, it did exactly the opposite for me. I came away from this book feeling very depressed. Her examples of how we can shift our bank accounts to smaller banks as a protest against the banks too big to fail is a case in point. Don’t bother – as soon as you do the big bank will buy your small bank. I know you have been told of the joys of being a customer – and how powerful you are as a customer. Well, there is something better to be and it is called a citizen. Anyone who tells you that you should be a customer rather than a citizen is stealing something from you much more precious than you can afford to loose. The only other part of this book that was clearly a nonsense was her repeating all of the stuff in Waiting for Superman about the evil education unions and how they are single-handedly responsible for the near total collapse of the US education system. My friend Laura put me onto this article by Diane Ravitch http://www.nybooks.com/articles/archi... that answers most of the overwrought criticisms of teachers and their unions that are used in this book. The collapse of the middle class in the USA and elsewhere is terrifying to watch. For much of the twentieth century it looked like capitalism had somehow dodged the bullet that Ricardo, Marx and Co. said was virtually inevitable – the total impoverishment of the working class they saw as a universal law of capitalism. It looked like we were heading instead for the total elimination of the working class as they became the middle class. But that is no more. And the problem is that the right people aren’t angry, the people who pay their taxes only to see those taxes be given to banks to prop them up, banks that then foreclose on the very taxpayer’s whose taxes saved them. Surely, those are the people you might expect to be angry. I find that if I think about this stuff for too long I start to feel seasick. Arianna Huffington’s book Third World America does a great job in waking us from this zombified state - before we set out to roam - by pointing out just where we stand, which is far from an efficient state that is beneficial to us – a state that if not addressed could lead to a third world status. She does a great job in pulling into focus the multitude of topics that come across our information highways on a regular basis, but that sometimes overwhelm us or get lost in the flood of it all. She uses numbers to paint a clearer picture for us on certain topics and more than anything she reminds us that there is still plenty for us Americans to do - things that most of us probably don’t think about because we’ve been so distracted by elections, international affairs, the effects of corporate corruption, ethnic/racial tensions, our superior status in technology, etc. Though we’ve convinced ourselves, or allowed ourselves to be convinced, that we’ve evolved to some superior state of a technologically lived life and left the past behind – the past of hard labor, the past of manpower, the past of building our great land - Huffington points out that these services are still desperately needed for so much, including of all things, a needed overhaul of America’s core infrastructure – our roads, our bridges, our dams, our electrical grids, etc. She does a great job of enlightening us as to why something as important as our infrastructure is so little talked about – reasons most of us already know such as our politicians being swayed by special interest groups and corporate lobbyists. Therefore she points out how if things are ignored we will be a third world country due to the condition of things as basic as our infrastructure along with our human condition because we didn’t utilize our human resources the way we could. Huffington is an intelligent, practical thinking person who doesn’t seem to play to any special interest other than the interest of common sense and her appreciation of America. Though she’s a Greek immigrant, she knows America’s past, understands its purpose, and seems to deeply care for its future – in other words, a true American. It’s refreshing that she points out the good and the bad of everyone involved as she sees it. This book will not be extremely revelatory for those who keep up with current events regularly (though a nice refresher), but it will be an intellectual, patriotic catalyst for those who don’t. Definitely a good book to awaken the American spirit! Scary book about how our politicians sold us out and are turning the USA into a third world country! We have let our infrastructure go so badly that bad roads cause more crashes than drunk drivers! In a 2008 study, 80% of Americans believed government was controlled by "a few big interests looking out for themselves." Averaged out, each member of the legislative branch received $6.5 million from special interests! "Not only have we failed to control corporations, corporations have flipped the equ Scary book about how our politicians sold us out and are turning the USA into a third world country! We have let our infrastructure go so badly that bad roads cause more crashes than drunk drivers! In a 2008 study, 80% of Americans believed government was controlled by "a few big interests looking out for themselves." Averaged out, each member of the legislative branch received $6.5 million from special interests! "Not only have we failed to control corporations, corporations have flipped the equation and taken control of us." When I read books that are so purposely written to promote an agenda or position, I always try to be extra cautious, and not to over react. Once again, Arianna Huffington has laid out a case by not only supplying facts, but by supporting these with hundreds of specific examples. I have listened to, and read, her ideas for some time now. I can tell you this; I believe we all need to hear what she has to say. We owe it to our families, and to our country, to open our minds and to consider her logi When I read books that are so purposely written to promote an agenda or position, I always try to be extra cautious, and not to over react. Once again, Arianna Huffington has laid out a case by not only supplying facts, but by supporting these with hundreds of specific examples. I have listened to, and read, her ideas for some time now. I can tell you this; I believe we all need to hear what she has to say. We owe it to our families, and to our country, to open our minds and to consider her logical and credible case. Arianna Huffington is the founder of The Huffington Post which is a liberal news and opinion site. http://www.huffingtonpost.com/ . This book is being used as a platform for change. Third World America attacks lobbyists and financial institutions for destroying the American middle class. It is more vitriolic against the Republican party than the Democratic party, but does not spare either side. Arianna Huffington's main focus of attack is the lobbyists and financial institutions which participated in creating the mortgage and financial crisis which drove many homes into foreclosure, eliminated jobs, and had devastating consequences for the middle class. She describes how foreclosures and credit card debt have created a poverty industry fueled by lobbyists. She gives many examples of how it is harder and harder to stay part of the middle class. Now, the dream is to keep what you have; stay in your home, keep your job, and hold onto your assets. Wealth is being transferred out of public institutions into private companies. Congress looks the other way when we bailout companies like AIG, pay massive amounts for contracts to polluters like British Petroleum, and don't monitor companies like Blackwater closely enough. She is describing a fusion of government with private industry that lacks transparency. This is most apparent in our infrastructure which is crumbling. Our roads, schools, trains, bridges, dams, and electrical grid all need upgrading. It is obvious that things are not quite working right. Trains are slower, schools are worse, and government is entangled. In my own industry, I have watched downsizing, layoffs, and cuts to libraries. Now, I am seeing for the first time corporate takeover of public institutions like libraries by private companies like LSSI http://www.nytimes.com/2010/09/27/bus... . It is an example of how companies will take over private institutions if possible, lower pay of people in communities, and be less transparent. What she is writing is very relevant to my own experience. The answers which she gives are very liberal in nature. Have the government hire more people in public service, invest in infrastructure, stimulate green jobs, stop foreclosures, and regulate Wall Street. I am not sure this will work that well. It is a consistent liberal message. It feels very much like the consistent conservative message about what we should do about the economy. Both have pieces that have been tried to limited effect. There seems to be an unwillingness to acknowledge the world has changed and we might need to change and try a slightly different approach. Where she most resonates with me is on the individual level. We can take money out of the banks and insurance companies which caused the crisis and invest in local banks and credit unions. We can start managing our personal finances better. We can also try to stay healthier, educate ourselves, and volunteer in our community. The personal steps which she suggests are not liberal or conservative, they are practical. The book has an index and extensive notes. It is written as liberal opinion piece for the man on the street. The book is muckraking, expressive, and entertaining. Arianna Huffington is a very smart woman, and as such I can’t blame her for wanting to write a best-seller, even if the logic behind it still confounds me (i.e. “I founded one of the most highly trafficked sites on the Internet, but you know what, I think I’ll write a book. Bound to reach more people that way!”) Third World America is a clean and informative introduction to what’s wrong with the country today (or at least what was two years ago) and anyone who doesn’t have their nose perpetually Arianna Huffington is a very smart woman, and as such I can’t blame her for wanting to write a best-seller, even if the logic behind it still confounds me (i.e. “I founded one of the most highly trafficked sites on the Internet, but you know what, I think I’ll write a book. Bound to reach more people that way!”) Third World America is a clean and informative introduction to what’s wrong with the country today (or at least what was two years ago) and anyone who doesn’t have their nose perpetually in the business section of the Times or Wall Street Journal would be well-served by absorbing all of this calamitous information in one fell swoop (I should note that it’s an incredibly fast read.) But for everyone else, those who have been following the news, much of this will come as a recap of things you already know, with very little else. Sure, Arianna has some good suggestions for getting America on the up and up, but she could have saved me 250 pages and just written a really nice HuffPo article. This book opened my eyes. As it's so aptly said - we have gone from trying to live the American Dream to living the American Nightmare. And this book is a no-nonsense account of who's to blame. But it's more than pointing fingers and naming names. Arianna helps us figure out what exactly we can do to turn the tide and stop our descent into the third world. This book was... fine. I think I have to stop reading the broad surveys of what is wrong with America and switch to more distilled analyses, because it all tends to run together. Also, as founder of HuffPo, Arianna displays some serious chutzpah by decrying the media's bias and sensationalism. Sorry to say this but "Third World America: How Our Politicians..." is true! At the time of the publication of this book, Huffington's focus was on the changes of American becoming a Third World nation but as my reading---- we are there! The world as we know it has come to pass with the downtrodden philosophy of this book. Politicians have betrayed us by abandoning the middle class and the poor thus helping the very ones who don't need it--- the 1 percenters and I'm not referring to the MC! “It’s Sorry to say this but "Third World America: How Our Politicians..." is true! At the time of the publication of this book, Huffington's focus was on the changes of American becoming a Third World nation but as my reading---- we are there! The world as we know it has come to pass with the downtrodden philosophy of this book. Politicians have betrayed us by abandoning the middle class and the poor thus helping the very ones who don't need it--- the 1 percenters and I'm not referring to the MC! This is in essence the tax reform that we witness the GOP secretly composed and passed under Trump's complicit administration. Surrounded by the utter nonsense being spewed by the no-nothing, balloon heads on the right (our founding fathers worked tirelessly to abolish slavery, spudnut moments, uprisings in Egypt leading to an Islamic caliphate, blah blah blah) who seem to worship ignorance with a passion previously reserved by 16-year old boys for Charlies Angel posters, I was ready to be revived by a good old fashioned screed from the left. Instead Third World America serves up failing schools, crumbling infrastructur Surrounded by the utter nonsense being spewed by the no-nothing, balloon heads on the right (our founding fathers worked tirelessly to abolish slavery, spudnut moments, uprisings in Egypt leading to an Islamic caliphate, blah blah blah) who seem to worship ignorance with a passion previously reserved by 16-year old boys for Charlies Angel posters, I was ready to be revived by a good old fashioned screed from the left. Instead Third World America serves up failing schools, crumbling infrastructure, a rise in economic disparity and a struggling middle class. Instead of welfare programs and big government spending, Huffington suggests re-inventing education through competition between schools, investment in infrastructure, tax structure incentives that promote small businesses, development of public transportation including high speed rail, public campaign financing, cuts in wasteful military spending, tighter restrictions on Wall Street and a breakup of the ‘too-big-to-fail banks’. Perhaps the right has gone so far off the rails into a delusional fantasyland of tea-bagging and tax cuts that simple, common-sense proposals and reasonable and rational discourse are now what pass for leftist rhetoric. The reality is that Huffington provides eminently practical and reasonable suggestions to help grow the economy and keep the US competitive in a changing global economic climate. Far from being a socialist manifesto, the book does a good job summarizing the economic problems we currently face and sensible steps that can be taken to alleviate them. Despite the title, the book ends on a hopeful note that I found to be completely unwarranted and out of touch with conditions on the ground. Being nice and investing in social capital may be a good thing, but doesn’t carry much weight in the face of a frothing, brainless, zombie mob of xenophobes who yearn to replace democratic governance with a theocracy and believe Obama is the anti-christ. Sorry to say, but stupidity is winning. Third World America has a lot of good, important stuff to say about what is happening in the USA right now (fall 2010). OK, so I'm a liberal and it supports my viewpoint, etc. I like having my viewpoint supported with facts. Topics covered include the rise of the Tea Party, the Wars in Iraq and Afghanistan, but most of the material is about economic matters: Wall Street criminality, corporate greed, mortgage fraud, bank kleptocracy, and the wholesale purchase of political influence by both parti Third World America has a lot of good, important stuff to say about what is happening in the USA right now (fall 2010). OK, so I'm a liberal and it supports my viewpoint, etc. I like having my viewpoint supported with facts. Topics covered include the rise of the Tea Party, the Wars in Iraq and Afghanistan, but most of the material is about economic matters: Wall Street criminality, corporate greed, mortgage fraud, bank kleptocracy, and the wholesale purchase of political influence by both parties. America is well on its way to being a third-world country, where paying bribes - oops, I'm supposed to say campaign contributions - is a good investment for businesses at most levels, but mainly at the top. But the facts are only perhaps 1/4 of this book, the rest is cloying 'personal stories' and the kind of meaningless name-calling and sloganeering I associate with the Right Wingnuts and tea partiers; and the Audible.com reading is of that ultra-sincere, again cloying earnest hogwash style. Ick! And perhaps worse, she makes some of the classic mistakes = propaganda techniques of dangling associations with the implication of connectedness, that there is little evidence for. Not exactly lying... (you see, like that). Arianna Huffington's "Third World America: How Our Politicians are Abandoning the Middle Class and Betraying the American Dream" is one of the most easily accessible and straight forward books I've ever read. Without holding anything back, Huffington uses her vast knowledge base and abundant resources to bring the facts to the American people about the Wall Street bailout, the dilapitated status of our infrastructure (bridges, roads, damns, levies), how awful our education system is, and she wra Arianna Huffington's "Third World America: How Our Politicians are Abandoning the Middle Class and Betraying the American Dream" is one of the most easily accessible and straight forward books I've ever read. Without holding anything back, Huffington uses her vast knowledge base and abundant resources to bring the facts to the American people about the Wall Street bailout, the dilapitated status of our infrastructure (bridges, roads, damns, levies), how awful our education system is, and she wraps it all up by saying that unless we do something, America will become a third world nation. This had to be one of the most hastily-written books ever. Did Ms. Huffington even have an editor? The first glaring error was when she referred early on to Jeremiah seeing the writing on the wall. Uh, that would be Daniel. If you don't know the Old Testament, find someone who does. Then she tried to spin that deteriorating infrastructure in the form of roads and bridges were causing hundreds/thousands of deaths. She mentioned the bridge collapse a few years ago in Minneapolis. That wasn't caused This had to be one of the most hastily-written books ever. Did Ms. Huffington even have an editor? The first glaring error was when she referred early on to Jeremiah seeing the writing on the wall. Uh, that would be Daniel. If you don't know the Old Testament, find someone who does. Then she tried to spin that deteriorating infrastructure in the form of roads and bridges were causing hundreds/thousands of deaths. She mentioned the bridge collapse a few years ago in Minneapolis. That wasn't caused by bridge deterioration, but by faulty design. Then there was a statement that all these people were killed because of bad road conditions. That would be ice, snow, rain, not potholes...puhleese. Finally, she offered no real solutions; she just tried to conjure up images of Thomas Jefferson, MLK, whomever. You don't have to be of any particular political persusion to see the truth in her arguments. We are watching America crumble and she gives the back story. She does counter the doom and gloom of the first two thirds of the book with things an individual can do right now, little spots of light to challenge the darkness (or, as Diane Sawyer said in her recent visit to Louisville, "light one little candle"). Important book for our times. Read this one while at the bookstore today, probably something frowned upon. A rather spot-on if somewhat depressing read. Goes into detail about how the USA is turning into a third-world country, details on what got us here, why we're not getting any better, and how we can take steps to try to reverse this trend. She has an amazing clear commonsense voice. It's refreshing to read her. You don't get lost in all the stuff. She's very intelligent and knows how to follow an argument. Horreendous and depressing, the stuff and events she puts down. The 5th chapter was a bit Pollyanna-ish, and maybe reaching a bit. Solid presentation of case though, most of this book. Well researched and fluid. This is a "must-read" book. Huffington's thesis, that the US will find itself a third world nation unless it quickly makes findamental changes, is sobering. Not to be all pessimistic, she devotes a section onwhat we are doing right. It is not a book born or politics and partisanship, but of concern and love for her adopted country. Initially, the idea of this book appealed to me and I guess the basic premise of the book is correct: America is crumbling, inequality is rising and the US needs a serious change of course if it wants to remain a global power in the long run. However, you won't get that idea from the actual contents of the book, as it is a completely incoherent piece of writing (I based the premise above on the flap text). Huffington is in populism overdrive and engages in elite bashing without any argumentation. Initially, the idea of this book appealed to me and I guess the basic premise of the book is correct: America is crumbling, inequality is rising and the US needs a serious change of course if it wants to remain a global power in the long run. However, you won't get that idea from the actual contents of the book, as it is a completely incoherent piece of writing (I based the premise above on the flap text). Huffington is in populism overdrive and engages in elite bashing without any argumentation. A lot of supposedly horrifying facts and quotes from other talking heads are sprayed around, but none of them is being put into context or subjected to any form of analysis. Instead, this collection of facts and quotes is supposed to speak for itself. In the early stages of the book, Wall Street is being accused of "going short on the American middle class"; 100 pages in, I still haven't got a clue how exactly Wall Street has done that (Well, I can think of a few ways, but Huffington surely doesn't tell me). That was around the point where I gave up (which I rarely do on a book) on Third World America. I think that most American readers will by now agree with Huffington's grim diagnosis of country's economic state. More and more of the middle class is steadily slipping into the lower class, thanks to outsourced jobs, a crashed economy, stagnant wages, rising costs of living, and fewer opportunities for advancement than ever. However, Washington DC, far from focusing on these problems, has become a servant to the agenda of a few immensely rich and powerful corporate leaders, providing them with I think that most American readers will by now agree with Huffington's grim diagnosis of country's economic state. More and more of the middle class is steadily slipping into the lower class, thanks to outsourced jobs, a crashed economy, stagnant wages, rising costs of living, and fewer opportunities for advancement than ever. However, Washington DC, far from focusing on these problems, has become a servant to the agenda of a few immensely rich and powerful corporate leaders, providing them with decreased regulation and taxes, lucrative contracts, and generous corporate welfare programs, even as they behave in all sorts of irresponsible ways (BP, anyone?). Investment in the nation's long-term future, especially infrastructure and education, is sorely lacking. The disconnect between the interests of the elite few and the troubles of regular Americans hasn't been so glaring for a long time. Very good synopsis of many ills that face our nation today. Short on answers, though. The author rightly points out how broken the political system is, but all of her solutions are political. Even in the 'what you can do as an individual' section is laden with political calls for National Service and openness to 'a more perfect union' of anti-individualism. Not all solutions were bad, but incomplete. She talks of the power lobbiests have in DC, then naively assumes public financing of elections w Very good synopsis of many ills that face our nation today. Short on answers, though. She talks of the power lobbiests have in DC, then naively assumes public financing of elections would strip them of that power. The reality is that the revolving door she describes to a nail has nothing to do with who finances elections, not to mention the harm that publicly financed elections would cause freedom of speech. If you want to limit the corruption of positions of power, innumerate the powers. If you want to increase the price of purchasing public policy, increase the heads that must be bought. Simply increasing the house of representatives to 1 per 100,000 (the ratio in 1913 when the size of the house was capped) would increase the cost of purchasing legislation by a factor of eight. Not the factor of 24 it would be if we used a ratio of 1 per 30000 as allowed in the constitution, but still significant. "Third World America" preaches to the choir somewhat, but it contains a lot of common sense ideas that can be put into action that I think will sound reasonable to Americans of any political persuasion. In particular, of the section where Huffington details steps average Americans can take to prevent the country's economic segregation from worsening, I found two parts particularly compelling: the section about how volunteering can change the outlook of the unemployed drastically; and the section "Third World America" preaches to the choir somewhat, but it contains a lot of common sense ideas that can be put into action that I think will sound reasonable to Americans of any political persuasion. In particular, of the section where Huffington details steps average Americans can take to prevent the country's economic segregation from worsening, I found two parts particularly compelling: the section about how volunteering can change the outlook of the unemployed drastically; and the section on how a return to empathy for others - something often dismissed in our capitalist society as "vestigial" or a sign of weakness - is sorely needed. I've heard people around me saying for some time now that the "middle class" is deteriorating. I didn't really even realize this to be true until recently when things pretty much hit home... the company I work for began to "outsource" a whole lot of our work to another country. This suddenly began to set the red flashing lights in motion for me and my co-workers alike. So far, no one has been let go... so far. But everyone is feeling unsteady these days. Not as secure as we once had. This book wa I've heard people around me saying for some time now that the "middle class" is deteriorating. I didn't really even realize this to be true until recently when things pretty much hit home... the company I work for began to "outsource" a whole lot of our work to another country. This suddenly began to set the red flashing lights in motion for me and my co-workers alike. So far, no one has been let go... so far. But everyone is feeling unsteady these days. Not as secure as we once had. I recommend this book to anyone who still believes that this country is still committed to working class families, the middle class and the American Dream. Arianna Huffington exposes how lobbyist and politicians have sold out America to corporate greed and special interests. This is a clearly written and extensively referenced polemic about increasing inequality in the USA and how it is leading to extreme poverty in what were previously the middle classes. Numerous quotes from Elizabeth Warren, I recommend this book to anyone who still believes that this country is still committed to working class families, the middle class and the American Dream. Arianna Huffington exposes how lobbyist and politicians have sold out America to corporate greed and special interests. This is a clearly written and extensively referenced polemic about increasing inequality in the USA and how it is leading to extreme poverty in what were previously the middle classes. Numerous quotes from Elizabeth Warren, Bernie Sanders and other heroes of the American working class. In May 2005, she launched The Huffington Post, a news and blog site that quickly became one of the most widely-read, linked to, and frequently-cited media brands on the Internet. In 2012, the site won a Pulitzer Prize for national repor Arianna Huffington is the chair, president, and editor-in-chief of the Huffington Post Media Group, a nationally syndicated columnist, and author of fourteen books.